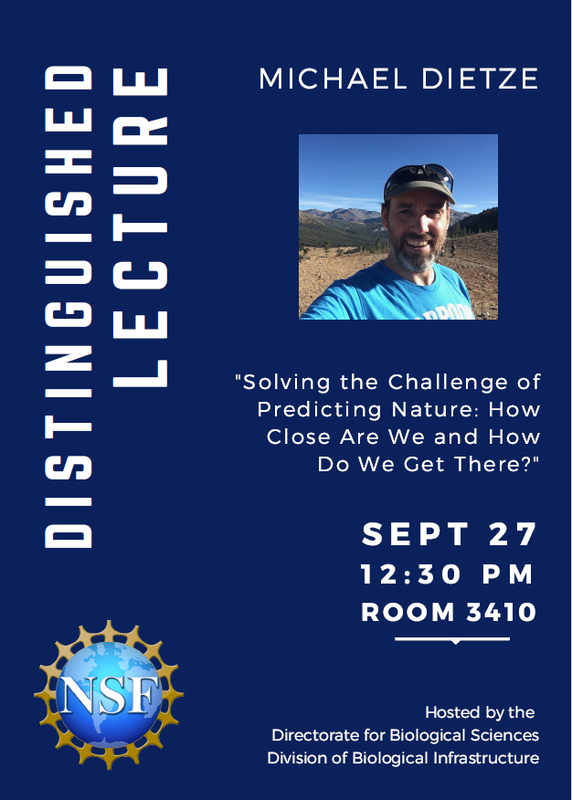 Title: Solving the Challenge of Predicting Nature: How Close are We and How Do We Get There? Webinar Access: Mymeeting webinar uses phone for and internet. Audio is only available over the phone: dial toll-free from US or CAN:1-877-708-1667.
click “Join an Event”, then add conf no: 744925156. No passcode is needed for the web. Abstract: Is nature predictable? If so, can we use that understanding to better manage and conserve ecosystems? Near-term ecological forecasting is an emerging interdisciplinary research area that aims to improve our ability to predict ecological processes on timescales that can be meaningfully validated and iteratively updated. In this talk I argue that near-term forecasting is a win-win for accelerating basic science and making it more relevant to society. I will focus on the challenges and opportunities in this field, spanning advances in environmental monitoring, statistics, and cyberinfrastructure. I will present a first-principles framework for understanding the predictability of ecological processes and synthesizing this understanding across different systems. Finally, I will highlight ongoing efforts to build an ecological forecasting community of practice. About the Speaker: Michael Dietze leads the Ecological Forecasting Laboratory at Boston University, whose mission is to better understand and predict ecological systems, and is author of the book “Ecological Forecasting”. He is interested in the ways that iterative forecasts, which are continually confronted with new data, can improve and accelerate basic science in ecology, while at the same time making that science more directly relevant to society. Much of the current work in the lab is organized within the Near-term Ecological Forecasting Initiative (NEFI) and the PEcAn project. NEFI is focused on addressing overarching questions about ecological predictability, while developing forecasts for a wide range of ecological processes (vegetation phenology and land-surface fluxes; ticks, tick-borne disease and small mammal hosts; soil microbiome; aquatic productivity and algal blooms) and advancing statistical and informatic tools for ecological forecasting. PEcAn is focused on the terrestrial carbon cycle, improving our capacity for carbon MRV (monitoring, reporting, verification), forecasting, data assimilation, and multi-model benchmarking and calibration within the land component of Earth System models. OneNOAAscienceseminars-request@list.woc.noaa.gov with the word ‘subscribe’ in the subject or body.